Middle school and high school students throughout the US are preparing projects for History Day, which takes place throughout the school year, with the national finals held June 10-14, 2018, at the University of Maryland, College Park. Projects include papers, websites, documentaries, performances, and exhibitions. Changing the Face of Medicine provides profiles of some of the women who have influenced and enhanced the practice of medicine. 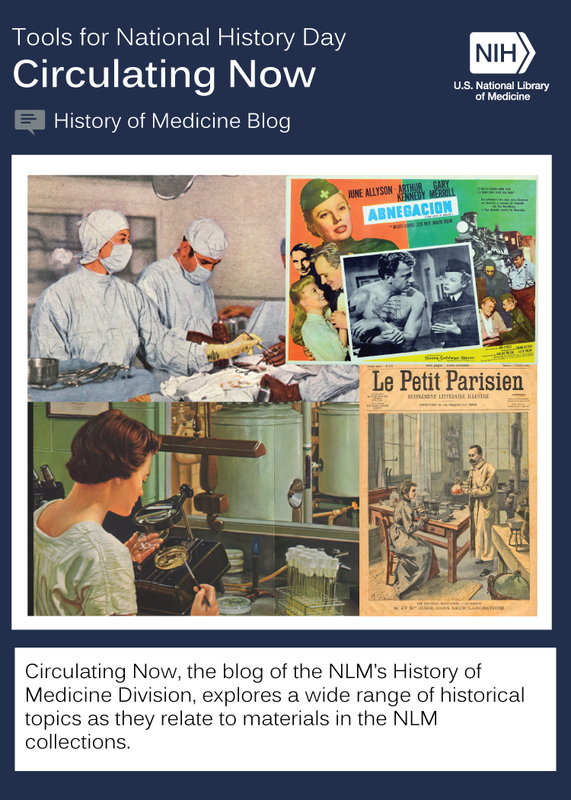 Circulating Now, the blog of the NLM’s History of Medicine Division, helps visitors learn about historical topics as they relate to materials in the NLM collections. 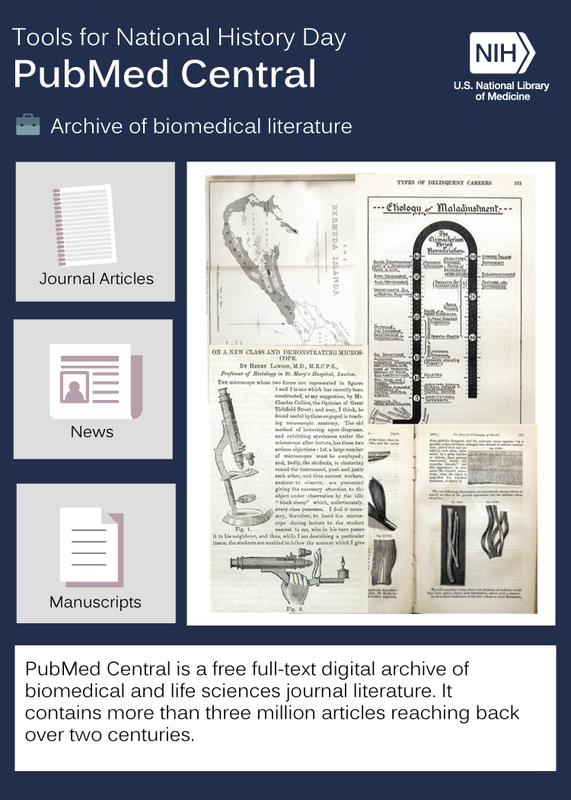 PubMed Central is a full-text digital archive of biomedical journals, reaching back over two centuries. 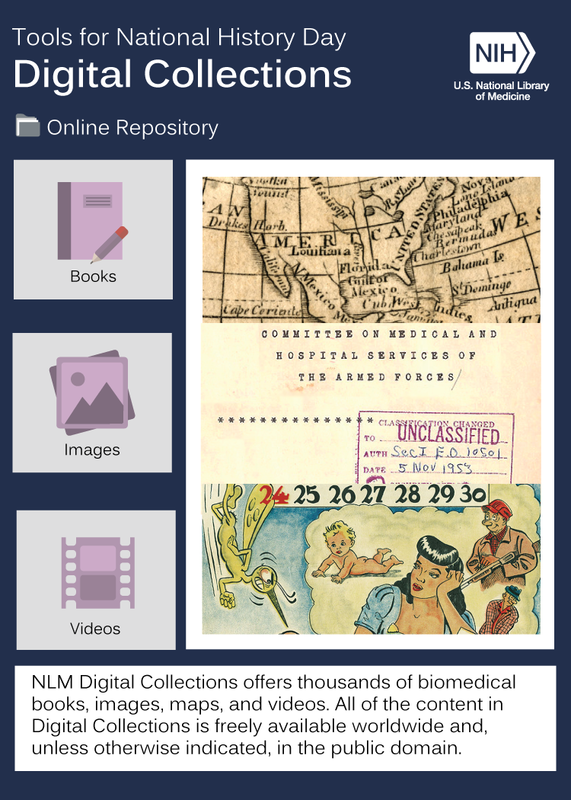 NLM Digital Collections offers thousands of biomedical books and tens of thousands of still and moving images. 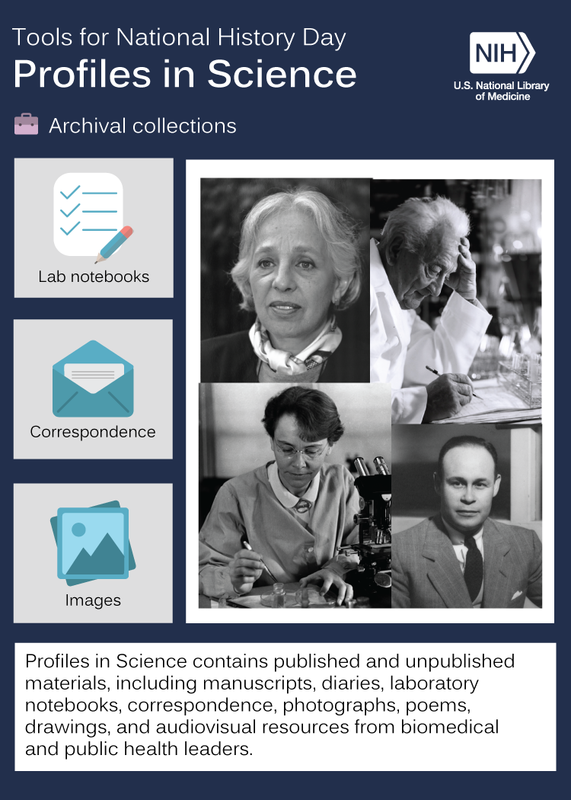 Profiles in Science celebrates leaders in biomedical research and public health by making portions of their papers available digitally. Unless otherwise indicated, content is in the public domain and free to use. 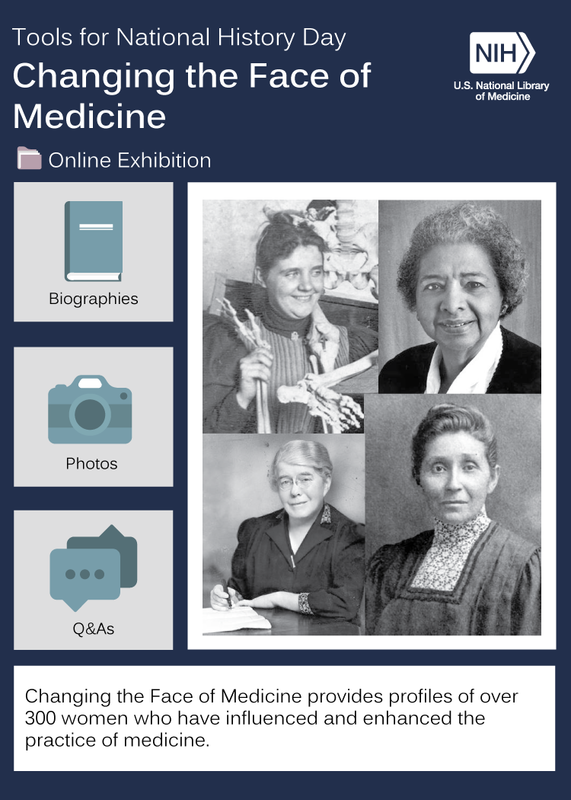 Through NLM resources, students can discover conflicts and comprise in medicine as it relates to medical perspectives of World War II, the politics of public health and the AIDS epidemic, challenges in health care shortages, rural and global health, the physician assistant profession, bioethical issues throughout history, and the struggle for recognition of domestic violence as a serious public health issue. Students across the US—and around the world—can browse our online exhibitions, explore our digital collections, and search our catalog for inspiration and images to inform their research and public presentations. Spanning ten centuries—from the 11th to the 21st—the NLM collections contain a wealth of material that documents how researchers and others in medicine and the health sciences have taken a stand for health and against disease. Every year National History Day frames students’ research within a historical theme. The theme is chosen for the broad application to world, national, or state history, and its relevance to ancient history or to the more recent past. 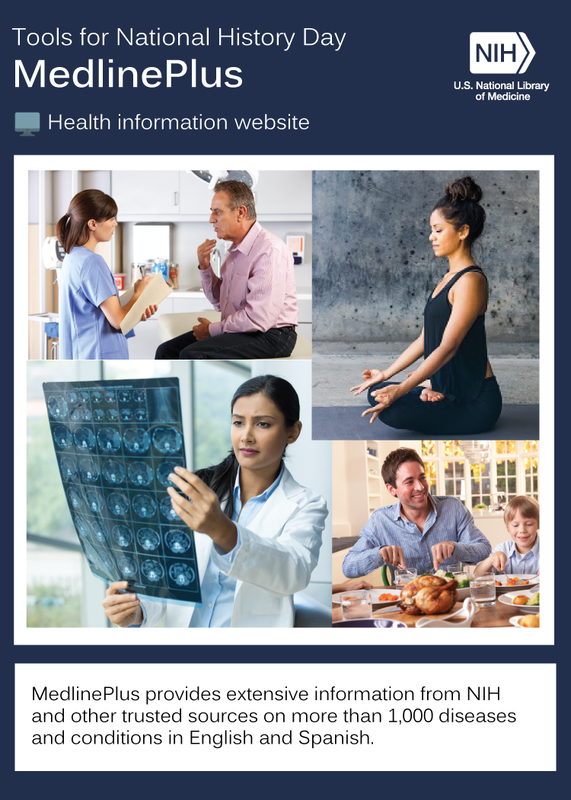 Have NLM’s resources helped you or a student you know? Let us know by commenting below. ← Happy First Birthday, NICHSR ONESearch!